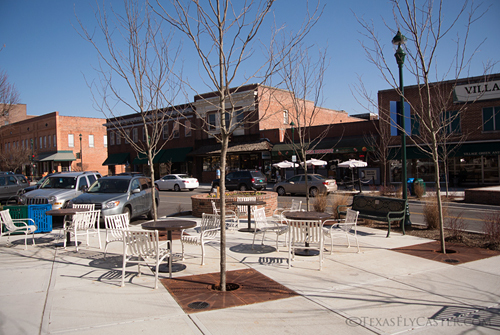 I have a thing for “Downtowns” after being involved in Denton’s Main Street development a lifetime ago. 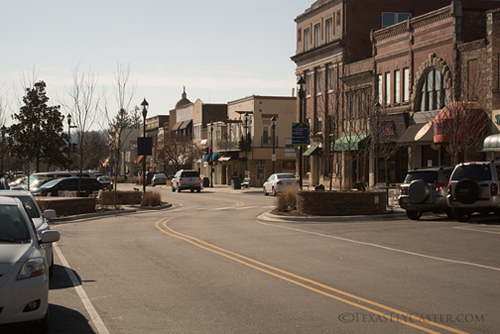 The two sides of Hendersonville’s businesses are so far apart that they were able to create a meandering one-lane and pushed the seating/sidewalk areas out at least fifty feet from store fronts. THIS IS pedestrian friendly. Good fortune smiled not a teeth showing smile, but smiled in January. I had a week on the road that took me to North Carolina, driving – completely loaded with gear for a factory photo shoot, and a little cranny of fly fishing gear, just in case. The photography itself was an eye opener, as I was unaware that factories of all sorts can still be using giant machines from the turn of the century to turn and churn a profit. Unless you’ve stood next to one of these giant behemoths that could remind you of a science fiction movie, or a historical documentary on the industrial revolution, it’s pretty hard to translate words into a visual image. Imagine a machine the size of an 18-wheeler tractor that chops solid copper core and then presses it into a ball, a big ball. It oozes oil from the hydraulics and not a single bearing has been replaced, so the grease congeals to cover the steelies inside that are probably a few thousandths off after nearly a hundred years. The concussion doesn’t shake the ground, but it does shake you if you’re standing close. It’s almost like it resets your insides and syncopates your heart to its slow beat. North Carolina. Strange days indeed. Monday was Martin Luther King, Jr. Day, and that was my first day in the factory. It had the feeling of a working holiday, and at some point I heard the “I Have a Dream” speech being played somewhere, somehow loud. We weren’t that far from Atlanta, and I had a strong sense of the moment passing through that beautiful skyline the night before. Deep South on a Deep South anniversary. The difference is palpable. As the photography marathon wound down, I started thinking about how close I was to my potential(I say potential because historians will certainly be vying for my ashes won’t they?) 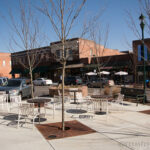 final resting place – Asheville, NC. It was about an hour away, so I began asking around the office about time and distance. One of the ladies (she’s probably younger than me, but I have no sense of my own age, so “ladies” will suffice) in the office poured on the hospitality, “You have to go to Hendersonville!” she said with that accent that made me want to grab a piece of toast and slather it on like butter. This is where, because of the buttery accent, I had to just roll with it. She printed out pages and pages of information on Hendersonville and Asheville, which was just up the road from Hendersonville. As I looked at the map, I could see water was in just about every direction, so going to Hendersonville was just as good as any. She recommended I visit a store called Mast General Store at 527 N. Main in Hendersonville. She also recommended Mean Mr. Mustard’s Cafe in Downtown Hendersonville.